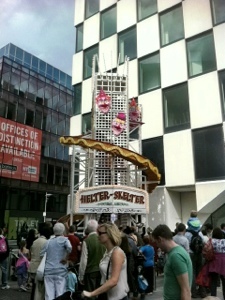 We had so much fun at the Tall Ships Festival this past weekend in Dublin. I wasn’t sure what to expect on our way in, but I’d heard from family and friends that it was worth a visit so we headed in before lunch on Saturday. Sometimes living north side has its advantages, because we were able to take the Port Tunnel in and park in the Point Village car park. Less than a five minute walk from the centre of festivities. Perfect. My mother had warned me to bring the buggy for Little Man because the crowds were so large, and I was very glad I listened to her. It was a bit overwhelming at times for me – I can only imagine what it would be like for a small child momentarily separated from his or her parents. And the crowds were so busy it could easily have happened. Needless to say, we kept Little Man either in the buggy or in our arms walking around – otherwise I’m pretty certain he would have been trodden on. Walking along the quays, the sight of the ships was magnificent. Not to mention the “pirates”! Little Man was in his element. We spent most of our day Saturday around the family zone in Grand Canal Square. I think that expense-wise, we got off lightly. Little Man asked to go on one ride – the Helter Skelter slide, which his Daddy took him on. Pricey at €6 for the two of them, but Little Man was too small to go up by himself. We should have known to expect a charge for Charlie too. But the rest of the time, the sights and sounds were amusement enough. We spent quite a lot of time in the wooden toy area, where there was plenty to amuse small children. Despite the hit-n-miss weather on Saturday, there was a real carnival atmosphere to the whole place. We enjoyed it so much we headed back in on Sunday morning to watch the ships leaving. The first ship pulled away shortly after 11am on Sunday and within the next 90 minutes, the majority of the fleet was gone. I met a few disappointed people who arrived in at 12.30 on Sunday to discover they’d missed it all. We were delighted with our experience though. I thought it made for a great family weekend. P.S. 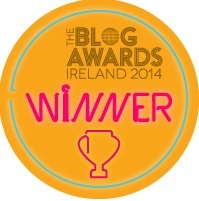 One of my blog posts has been nominated for Best Blog Post for Blog Awards Ireland 2012. Check it out and if you like it, please vote for it. 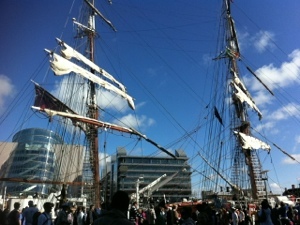 I would have loved to have got to Dublin for the Tall Ships Festival. It looked spectacular on photos and coverage on TV. Glad you enjoyed your day there. Ellie recently posted..Stop. Breathe. And Start Again. Glad to hear you enjoyed the tall ships and that you listened to your mother for once.